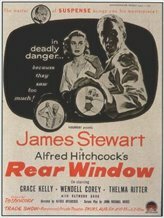 Rear Window is incredibly boring. I hated Big Top Pee Wee when I first saw it in 1988. But I watched it again last year and, while it's still a miserable failure compared to Pee Wee's Big Adventure, it wasn't as horrifying as I remember it being the first time I saw it. Pee Wee gets the not here, but I reckon it's ranked about 1200 on my list of 1423.